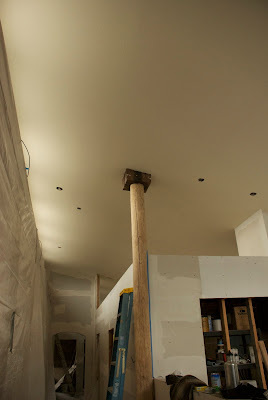 Last week, we focused our efforts on completing the ceiling on the north half of the main room of the house. 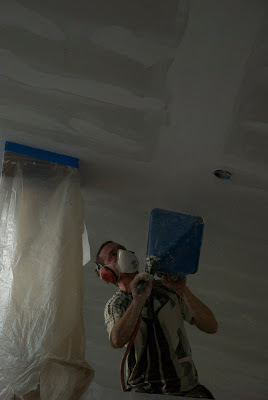 For a long time before our vacation, Aaron was working on mudding and taping the ceiling in preparation for texture. Once we returned from vacation, Drew and Aaron sanded the seams to smooth them out. Then Drew and I spent two days (!) masking and draping the walls. Well, it wouldn't have taken quite so long if I wasn't pregnant and Drew wasn't recovering from the flu! Finally, we diluted our bucket of mud, and loaded some into the hopper to test the spray and see how easy or difficult texturing is. Turns out, it's not THAT hard, though there are some simple tricks that make it a lot easier. Like having thin enough mix, for example. Once we decided on a coverage amount and got the gun nice and clear, it was smooth sailing, though the boys' arms were very very sore by the end. After we let it dry for a day and a half, we primed the ceiling with ASM's SafeCoat New Wallboard Primer. This is a very low VOC primer, considered non-toxic. 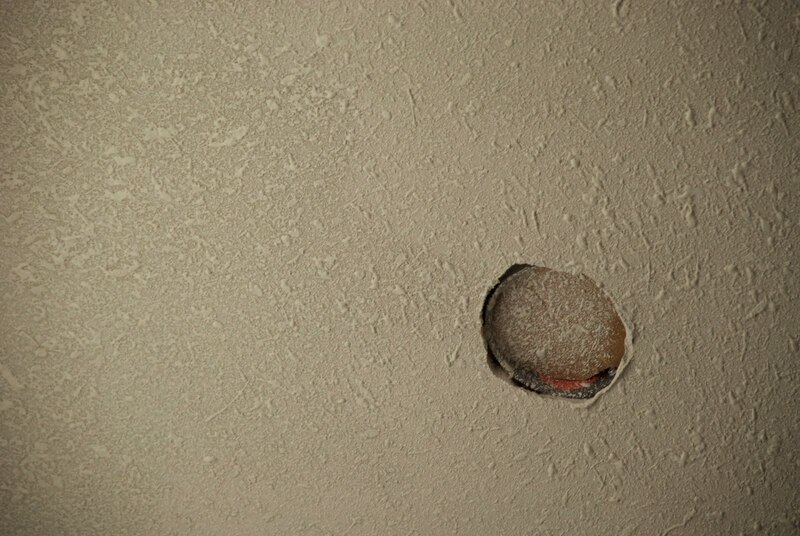 The following day, Drew and Aaron painted the ceiling with two coats of Yolo Colorhouse Paint in Color Air.01. Yolo Colorhouse is another no-VOC, non-toxic paint product that we get at our friendly, neighborhood green building store, Alternative Building Center in Eureka. It's a soft, slightly yellow white. Our goal for this project was to make the tape seams invisible. We mostly succeeded. You can see them in a few spots, but mostly, it looks really great. We're pleased, and NOW we can get on to finishing the walls in that whole area of the house...did I mention we're working on our bathroom, too? I'll make a post about that, it's looking really nice.